A NEW FOUR-BUILDING project that will be the largest office block development in Cork city when completed has just cleared its final planning hurdle. In September it was announced that four new office buildings would be constructed in Albert Quay in the city’s docklands region. The €90 million ‘Navigation Square’ office complex, covering 310,000 sq ft, will be capable of holding some 3,000 people when completed. It was hoped that work would begin in 2016 and be completed by the autumn of 2017, but the process was delayed as several appeals were submitted to An Bord Pleanála. The planning body has now confirmed that all remained appeals have been withdrawn, and developers O’Callaghan Properties are clear to complete the project. The company has said that work on the project will start in the summer and is due to be completed by December 2018. As many as 350 people will be working on the project during its construction phase. In total, four different buildings will built on the 2.25-acre site bounded by Albert Quay to the north, Victoria Road, Albert Road and Albert Street. The developers had previously planned to build an events centre on the site but planning permission was rejected. The events centre will instead go ahead on the site of the former Beamish and Crawford brewery. It’s envisaged that the development, which is just a few minutes away from the city centre, will include roof terraces with restaurant units and staff facilities. Developer Brian O’Callaghan said that the new office development will be geared towards ”large-scale multinational and indigenous investment projects”. “It makes a big statement for Cork and really affirms our capacity to be a viable counterbalance to the Dublin region,” he said. The project is just one of several planned for Cork city that have recently shown signs of progress. Notably, developer Stone Work Properties announced at the start of the year that it is planning to build a new €20 million ‘landmark’ office at Camden Place in the city’s northern quays. The building will be able to hold 500 workers, and it is hoped will help lure multinational firms to Ireland’s second city. Another office block, which will accommodate 450 workers, is also planned for Cork city’s historical business district, the South Mall. The block would be just minutes away from ‘Navigation Square’. Email “This huge office development could transform Cork's business centre”. 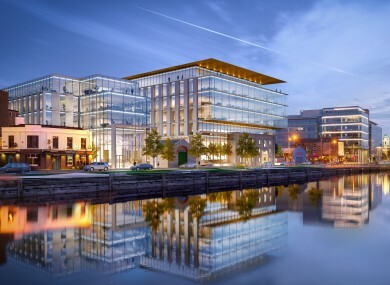 Feedback on “This huge office development could transform Cork's business centre”.